These days, there are more options for seniors and persons with physical limitations and limited mobility than ever before. We believe that people should live as comfortably, safely and independently as possible. Let us help you get to where you need to go. 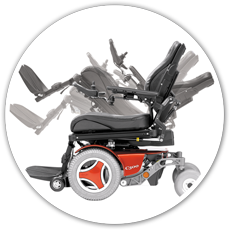 Mobilis offers a full line of adult manual and power wheelchairs from top manufacturers, as well as other home equipment. Our specialty is Complex Rehab Technology, which is individually configured and custom designed complex wheelchairs. Should your equipment need service; you can count on our certified repair department to get you back on the go. Lightweight Power Chair: Can be taken apart into several sections and/or folded to allow for transport into your car. Small in size, light-weight, standard seat sizes and options. Group 1 Power Chairs: Ideal for basic mobility for short periods of time, over short distances on mostly level surfaces. Standard Power Chair: Designed for everyday use and constructed to go faster and farther than Group 1 chairs. Captain's style seats, solid seats or sling upholstery in a variety of sizes. Works best in level to moderate uneven surfaces. Active-duty Power Chair: Built for durability, adjustability and performance. Larger frame, batteries & more powerful motors to allow for long distance over level to rough terrain. Multiple positioning options, tilt, recline, & elevating leg rests. Seat elevator options are available. Group 2 Power Chairs: Great choice if using a power chair for most of your mobility needs where you lead a mild to moderate active lifestyle. Great for in-home use and provides tight turning radius for all users. If you use a power chair for all mobility, have an active lifestyle and/or more complex seating and positioning needs, these chairs are the optimal choice. "Very active-duty: Have all the same options as the Group 3 chairs, but are even more durable and rugged. With the most powerful motors and largest batteries, they go further and faster and can maneuver over anything from level, surfaces to rough, uneven terrain. An ideal choice if you lead a very active lifestyle and encounter many different types of environments and terrain in your daily activities. We are happy to assist you.